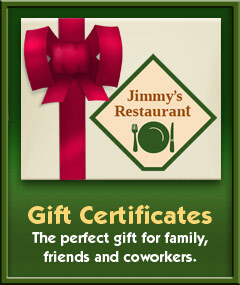 A favorite restaurant in Chicago's northwest suburbs, Jimmy's in Des Plaines is open daily for breakfast, lunch and dinner. We offer a wide variety of hearty breakfast selections including our famous crepes, skillets, pancakes and fluffy omelettes. And for lunch and dinner, Jimmy’s is proud to offer everything from great wraps and sandwiches to satisfying salads, burgers, steaks and our famous pork chops. Order spirits with your dinner, or stop by the bar to relax, enjoy some music and catch the big game. Jimmy’s also offers comfortable outdoor seating on the patio during warmer months. Catering and carry-out are also available. Be sure to ask about our gift certificates!